$25.00 Medal "From the Grateful Afghan People". Issued to all Soviet troops who served in Afghanistan. An attractive, apparently issued example in very fine to excellent condition. $12.00 Unissued award document for the Grateful Afghan People Medal. Excellent condition. $9.00 Soviet Honorary Badge "To a Warrior - Internationalist". Brass, enamels. $19.00 Medal to a Veteran-Internationalist, est. 1998 Reverse shows the list of faraway places where Soviet troops were involved over the years: Spain, North Korea, Cuba, Middle East, Vietnam, Afghanistan. $120.00 Afghan Medal for Valor, 1980s. Superb example with perfectly preserve silver finish and original ribbon included. "Orders and Medals of Communist Afghanistan"(under "Communist Countries"). $5.00 Combined Arms Specialist Badge (for officers), 2nd cl., 1960s- 80s. To see other badges awarded by the Soviet Military, please visit our category "Soviet Army Badges Cold War Era" (under "Soviet Badges"). $2.00 Army Proficiency Badge (for enlisted men), 3rd cl., 1980s. 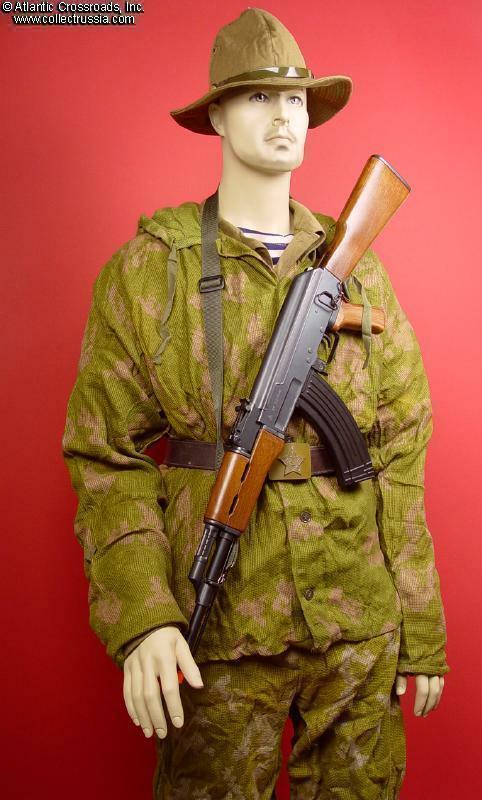 $85.00 M 1982 "Afganka" two-piece combat uniform, 1980s. Includes Extra Small size (US size 36) jacket and pants. In mint unissued condition. $65.00 Soviet Army Sergeant's and Enlisted Man's field uniform jacket. Size 46-2, 1977 dated, in excellent unissued condition. Worn at very outset of the war in Afghanistan. $150.00 KLMK "Computer Pattern" Camouflage One-piece Coveralls, dated 1978. This uniform is among the first KLMK suites produced, and also one of the few from the early Afghan War era to survive. Large size, in excellent unissued condition. $495.00 GRU Spetsnaz Winter Uniform, dated 1977 / 76. Includes heavy tunic in olive drab with additional separate button-in padded liner and tsygeika lamb fur collar, plus matching pair of pants, also with detachable liner. Size 52-5 (Medium / Large). This is a rare, very early issue of the winter uniform which was later modified to become a well known Afghanka. Both the jacket and pants are in superb unissued condition, with manufacturer's tags. $450.00 KGB Border Guard / Spetsnaz Camouflage Winter Uniform, dated 1987. Includes heavy tunic in "Computer" camouflage pattern with additional separate button-in padded liner, plus matching pair of pants with suspenders, also with detachable liner. Well above the usual quality standards of most Soviet Uniforms. Medium size, Russian 50-4. Scarce matching set in mint unissued condition. $55.00 Airborne Spetznaz soft helmet, winter type, dated 1988. Excellent unissued condition, size 58. $110.00 ShZ-78 Air Force ribbed leather, WINTER model with fur liner, dated 1980. Size 57. A superb Afghan War era example. To see other Cold War era Soviet aviation gear, please visit "Soviet Jet Aviation Memorabilia" section of our website. $45.00 ShL-78 Air Force ribbed leather helmet, summer version, dated 1982. Size 59 (about US size 7 3/8). A scarce Afghan War era example in superb condition. $10.00 Army enlisted man field belt, green painted rectangular buckle with Soviet Army insignia. Excellent condition. $35.00 Chicom AK-47 chest pouch, so-called "Lifchiki" (bra) used by both sides in Afghanistan. Dated 1983. In unissued condition. $55.00 Communist Afghanistan Army officer hat badge for a service hat, 34 mm version, 1980-87. Early model featuring a book of Koran. In excellent condition. $75.00 Communist Afghanistan Army officer hat badge for a full dress visor hat, larger 60 mm version, 1980-87. Early model featuring a book of Koran. In very fine to excellent condition. $25.00 AKS-47 assault rifle canvas cover, 1980s. Made for folding stock airborne version of Kalashnikov.